For as long as I can remember I've suffered with acne around my t-zone, I know a lot of people get acne all over their face and its very rare to suffer with it in one certain spot on your skin but I do - and it's due to my medication. When I was put on my medication I had wonderful skin, but then over time it got worse and worse, so I mentioned it to my doctor and he said it's acne due to my tablets. Unfortunately I can't anything medical for it so I've had to find the right beauty products to balance my skin, and after what feels like a life time (at least ten years) I've finally found some amazing products which really make my acne and dry skin look and feel lovely! Note: I want to note that I haven't changed too much with my skincare routine from my last one because I do know what I like and what I don't and it is rather hard for me to find something for my skin that I'm not going to have a reaction to. First thing I do is use my Elizabeth Arden New York All Gone Eye & Lip Makeup Remover* whilst I have a bath running, I've been using this stuff for ages and I really love it - it's such good value for money. I pop some on a big cotton wool pad and wipe off all of my make up, I really love using this on my eyes because it does take all of my eye make up off in one go and if you know me then you'll know I love my eye make up to be very colourful and every black for eye liner and mascara so it can be hard to find a great product that doesn't leave me looking like a panda. Once my bath is filled I'll get into it and whilst in the bath use my Green People Organic Lifestyle Foaming Face Wash*, by putting two or three pea sized amounts on my face and neck concentrating on my problem areas and massage in gently. I like to use this for about 30 seconds to one minute and rinse off with water using a face cloth. When I'm out of my bath I like to go over my face once more to make sure everything is off it using my Garnier Skin Naturals Micellar Cleaning Water*. I've raved about this product so much on my blog and on my social media accounts, it's been included in blog posts such as: My Top 6 All Time Products, My Winter Evening Facial Routine, and My Summer Morning Facial Routine. 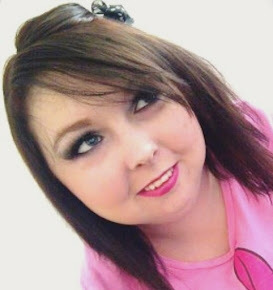 I've also done a blog post reviewing this products which you can read by clicking here. Once I am convinced everything is off my skin I pop some of my Garnier Skin Naturals Softening Toner onto a cotton wool pad and wipe it all over my face. I really love the smell of this stuff, it is a beautiful watermelon and grapefruit smell which just makes me smile every time I put it on. Next I take my Noxidoxi Enhencing Serum Base* and use a pea sized amount all over my face and neck, this stuff is just wonderful and really makes me feel like my skin is evening out when I've applied it. I've really noticed a difference in my skin since using this serum base so a massive thank you to Glossy Box for giving me it in one of their monthly subscription boxes. Once my has soaked into my skin I take my Moo Goo Skincare Full Cream Moisturiser* and spread about two pea sized amounts evenly all over my face. 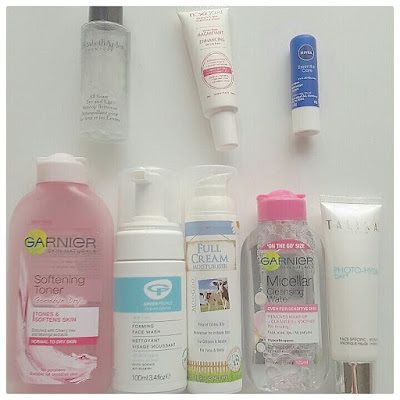 Everyone knows how much I love this stuff because I mention it constantly but if you would like to read more about it then here are so links to my past blog posts were I mention about it: #LPL Blog Event, My Top 6 Products of All Time, My December '15 Favourites, The Best of 2015, and My March '16 Favourites. On days I'm wearing make up I also pop come of my Talika Paris Photo-Hydra Day Face Specific* onto my skin for some extra brightness. This stuff is great is you're taking pictures, taking selfies or if you're at an event all day/night as it really shows your skin beautiful and even-looking in pictures. To finish off I use a lip balm and recently I've been using my Nivea Essential Care Lip Balm* for some extra smoothness and anti-dryness on my lips. 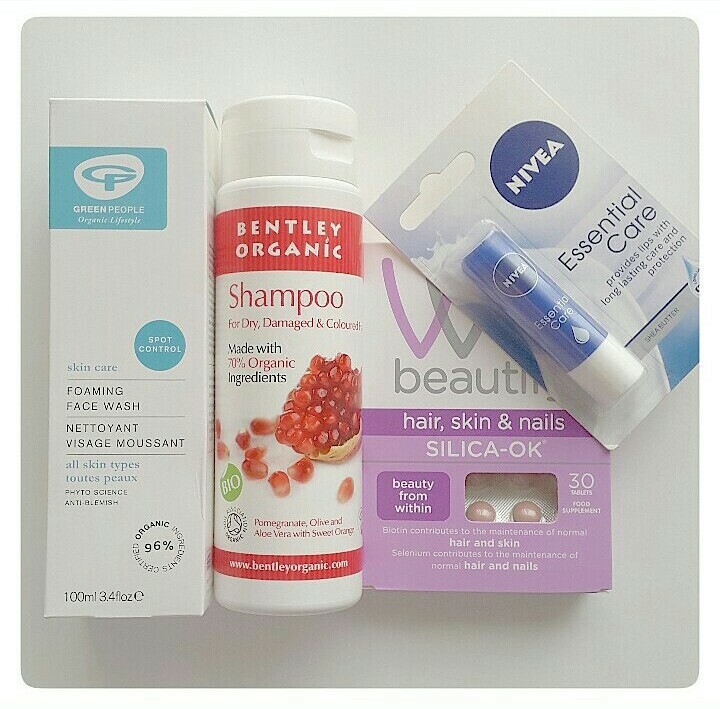 I also want to say a massive thank you to Healthy Foods Ltd for sponsoring me for this blog post and sending me some awesome beauty products to try out. My favourite has to be the Nivea Essential Care Lip Balm! Thank you to you all for reading this blog post, I'd love to know your thoughts on the products mentioned? If you enjoyed reading this blog post then you may also enjoy My Winter Evening Facial Routine or My Summer Morning Facial Routine. I hope you all have a really wonderful day! Great post lovely. 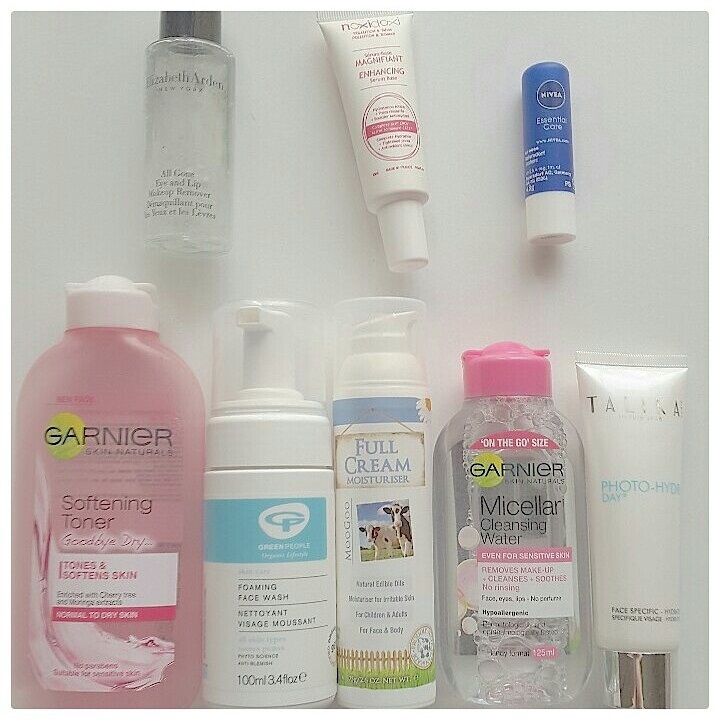 I've tried so hard to love the Garnier Micellar Water but it's just not happening for me. I use it if I'm feeling lazy but I just don't enjoy it really.